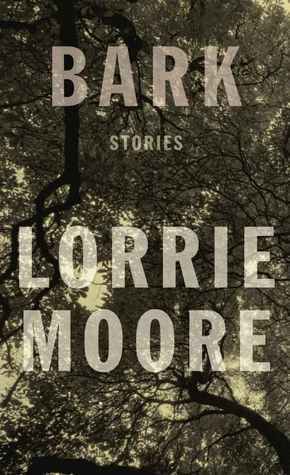 Highly acclaimed author Lorrie Moore has released a new collection of stories. The characters in these tales are dealing with the fallout of divorce, the devastation of losing a loved one, and the everyday pain of trying to connect with a child with disabilities. There are only eight stories in this collection, but their inhabitants try to put on a brave face and perhaps offer a wry quip or two as they stumble through the pain and uncertainty of life. I enjoyed Lorrie Moore's novels A Gate at the Stairs and Who Will Run the Frog Hospital? and was looking forward to reading her short stories. But I found myself disappointed in this collection. When you are reading a novel, you get to see the writer do many things because there are hundreds of pages and many plot events to write. In a short story collection, readers want to see the depth and the width of a writer's ability. Some of my favorite collections make me cry and laugh, all within the same book. But Bark feels very monotone. Each of the stories seems to deal with characters who are dealing with long-term pain. Moore does not show us the moment when the pain starts or the moment when it seems they can't take it anymore. Instead, she focuses on the moment in the middle when it seems like it will never end and grief will just be a terrible and continual part of life. Moore seems to lose the essence of the stories in trying instead to be clever and political. There are many good lines in these stories that are funny but it feels very forced, as if Moore is asking us to realize just how clever she is. I also got tired of the political undertones in several of the stories. In the title story, Ira's despondency over his failed marriage and his new girlfriend's lack of interest is compacted by the war he can't stop watching on TV. In the story Foes, Bake gets into a heated disagreement at a benefit dinner with a woman who lobbies for the conservatives and was badly burned during the attack on the Pentagon. Instead of feeling sympathy or pity, we are left with a vague feeling of disgust, both for her politics and for her person. I liked Lorrie Moore as a writer. She is incisive and can write the sort of phrases that punch you in the gut with their beauty and precision. I understand why she is revered by many in writing circles. Unfortunately, Bark didn't do it for me. I find that many of the stories that impact me the most are those that give thought to both light and dark, tragedy and joy. This collection of stories just left me feeling bleak. Bark is a great title and Moore is a talented writer. Some collections just work better for you than others, I suppose. Sorry to know that you didn't like this book as much as you had hoped to, Lindsey. It is hard to read when all the stories in a collection are bleak. I think I might have read one short story by Lorrie Moore in an anthology, but I can't remember it now. I hope you like the next book you read better. I really wanted to like it because I like Moore as a writer. Oh well! A professional writer will ensure that your admission essay is written using international writing style, buy essays online it is correctly formatted, and it has the necessary content.